Last week, I talked a little bit about the Mediterranean diet and posted links to some of my favorite Mediterranean and Sephardic recipes. 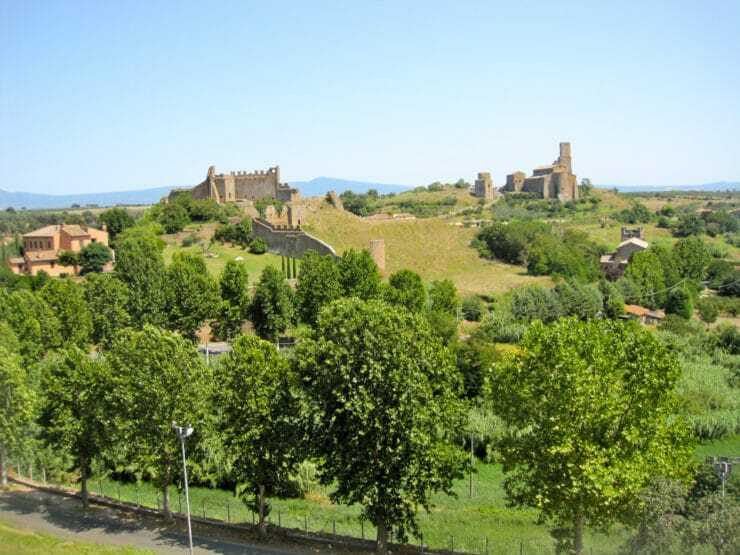 Writing that blog brought me back to a culinary trip I took in the summer of 2009, when I explored the Mediterranean food cultures of France and Italy. The unique flavors in this region are very special, and they have inspired my cooking ever since. It seemed like wherever I went in Italy, the smell of fresh herbs was in the air—in particular, basil. I wouldn’t be surprised if basil is considered the “national herb” of Italy. I tasted it everywhere– in salads, pasta dishes, soups, bruschetta, and in other more exotic dishes. The earthy, bright and pungent flavor of basil tastes like an Italian summer. 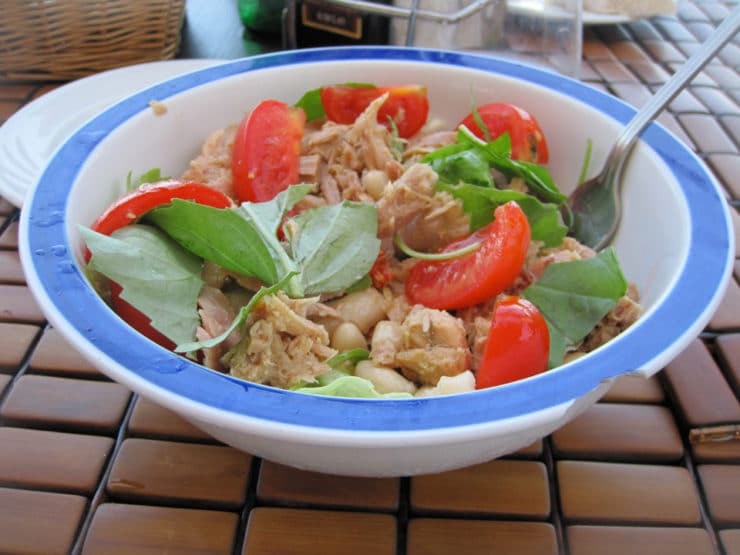 A Mediterranean tuna salad I enjoyed in Capri, Italy – tuna, fresh basil and tomatoes from the restaurant garden drizzled with olive oil. So simple, so delicious! A thick sauce made from fresh basil, called pesto, is served throughout Italy, especially in the Liguria (Genoa) region where it originated. It was in Italy that my love affair with pesto began. 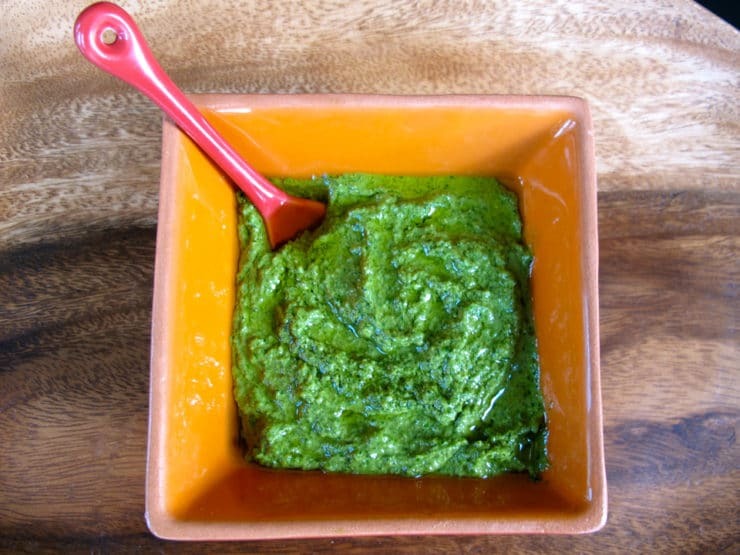 Pesto, the pride of the great Italian sea part of Genoa, is a thick sauce which is excellent with pasta or fish. It does not require cooking, but is one of those recipes where you have to add olive oil carefully and gradually to a mixture which you have pounded with a mortar; the pounded ingredients are garlic, pine nut kernels, grated parmesan cheese (or Sardo from Sardinia), salt, and fresh basil leaves. The flavor of basil is dominant. Delicious, right? I’m getting hungry just thinking about it! Traditionally pesto is made just as the Oxford Companion describes with fresh basil, pine nuts, garlic, salt, and grated parmesan. Over the years chefs have taken liberties with the pesto concept, using sun dried tomatoes, different nuts, and a variety of herbs to change the flavor of the spread. While I have a particular fondness for the traditional version of pesto, it’s fun to get creative and try new flavor combinations. Once you get the basic idea, pesto can be a really versatile cooking concept that will add an herby spring flavor to your everyday cooking! Later this week, I’ll be posting two fabulous dishes that include pesto. But first, I want to give you my recipes for the sauce itself. 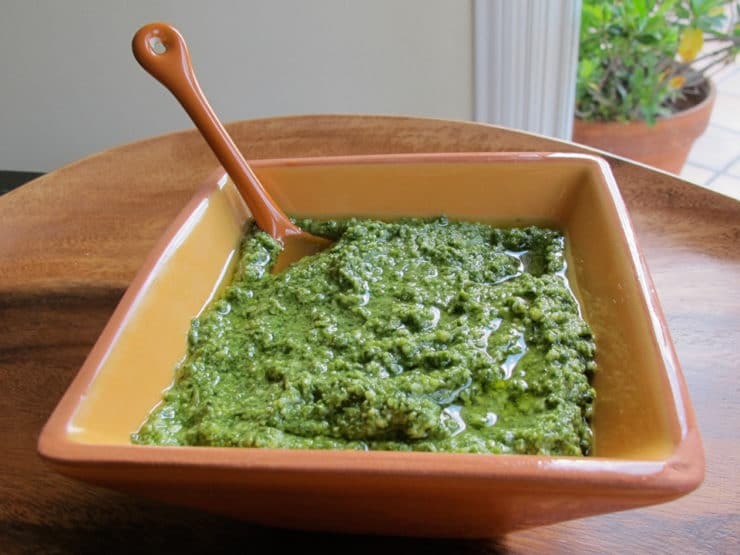 I’m sharing my recipes for both traditional pesto and a dairy-free pareve pesto that can be used with kosher meat dishes. I’ve also included some serving suggestions and cooking ideas, along with a few tips for storing the sauce and prolonging shelf life. This sauce is heart healthy, gluten free (with a certified GF pecorino or parmesan cheese), delicious, and so versatile. What’s not to love?? Making pesto the old fashioned way, with a mortar and pestle. 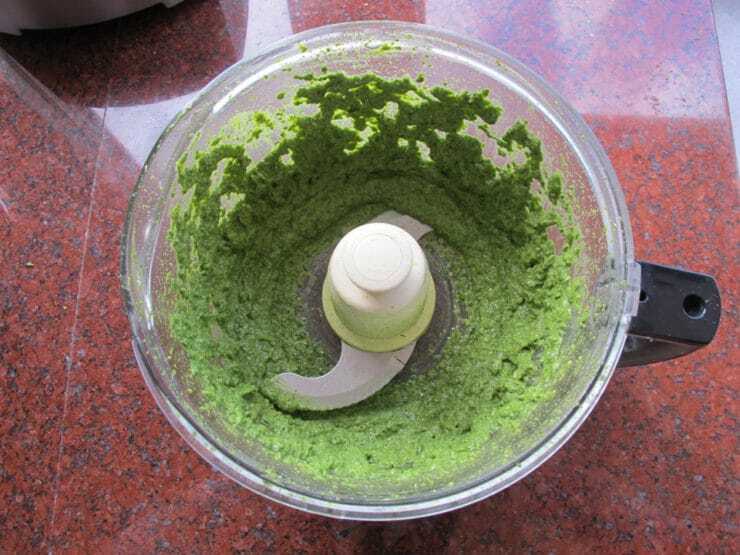 Pesto is actually the word for “pounded,” because the proper way to make it is pounding/grinding it with a heavy mortar and pestle. 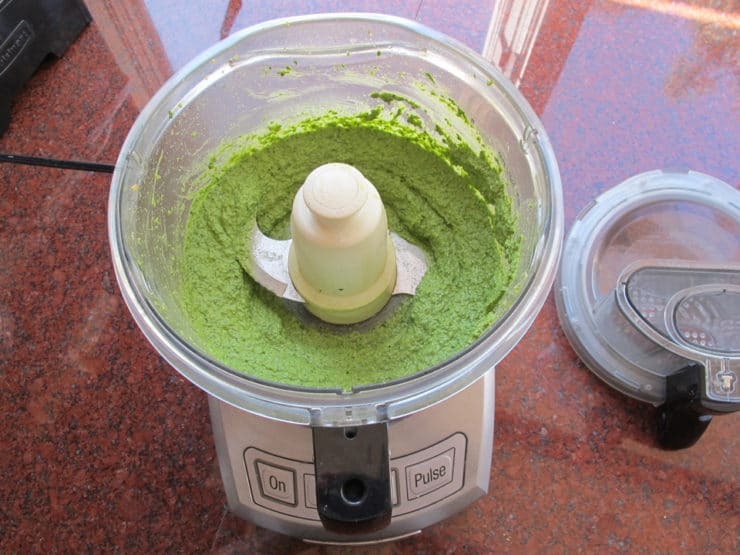 Most modern cooks don’t “pound” their pesto anymore because it’s laborious and time-consuming. 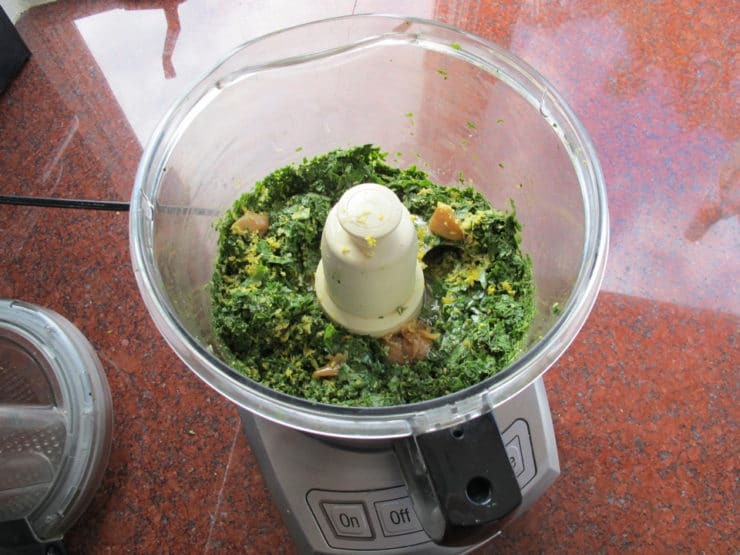 I’ve given instructions here for making pesto with a food processor or blender. If you have the time and energy, by all means feel free to “pound” it the old fashioned way… it will taste even better! 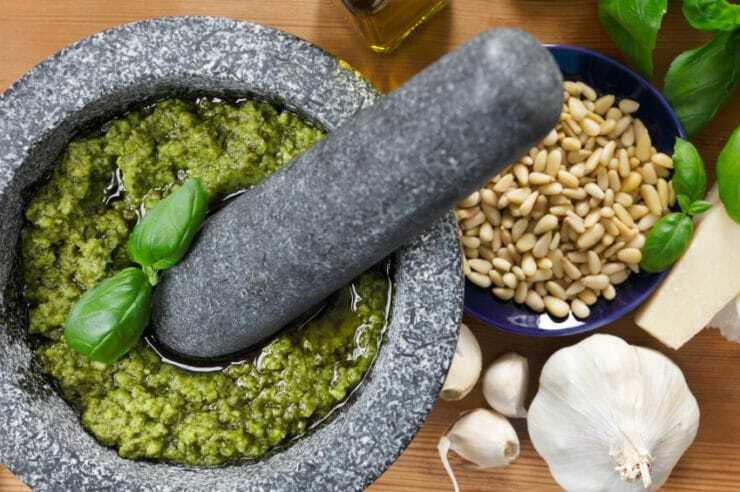 Learn the origins of healthy Italian basil pesto sauce. Includes two recipes for pesto, traditional and dairy-free. Kosher for Passover, Pareve. You will also need: Food processor or strong blender. Nutrition information is for Dairy option. If you are using roasted garlic, roast it prior to making your pesto. For instructions, click here: How to Roast Garlic. Warm a skillet over medium heat. Add the pine nuts to the skillet. Stir them continuously until they’re toasted golden brown. Remove from heat. 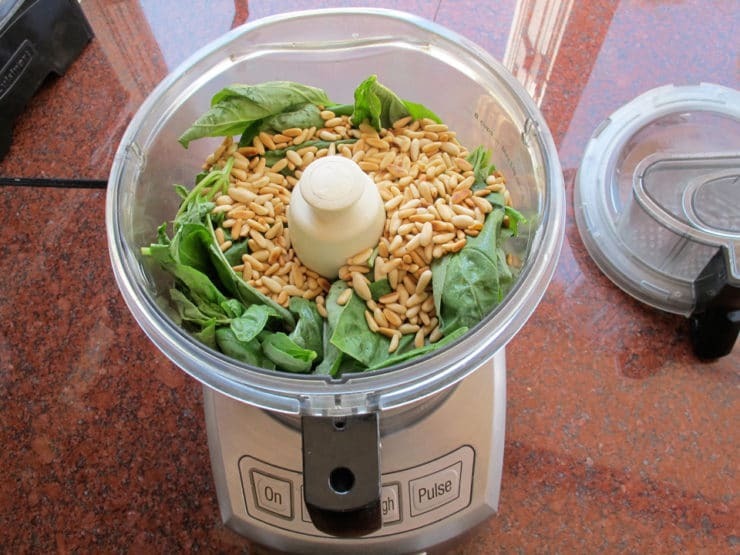 Add toasted pine nuts to a food processor along with 4 cups of fresh, clean basil leaves. Pulse the nuts and leaves together into small pieces. Scrape the sides of the processor. Add 1/3 cup extra virgin olive oil along with the garlic, and lemon juice. Process again, scraping the sides periodically, until the mixture becomes creamy. Scrape basil mixture into a mixing bowl. …adding more olive oil if desired, to create a smooth paste. Some people like a thicker pesto, while others prefer a more liquid pesto for drizzling. If you’d like a more liquid texture, add more olive oil by the tablespoon and stir till you get the texture you want. Add more salt to taste, if needed (taste first, you may not need any if your cheese is on the salty side). This pesto is dairy. If keeping kosher, make sure you use it with vegetarian, fish, or dairy dishes only (certain Jewish traditions do not mix dairy and fish). Warm a skillet over medium heat. 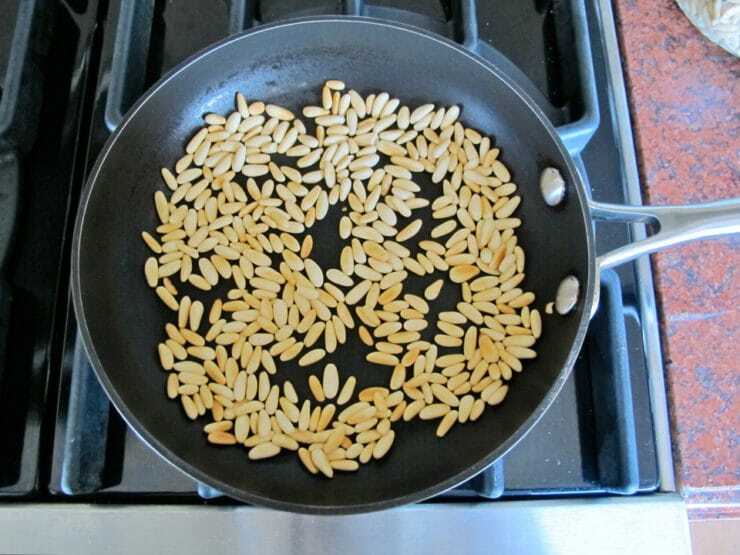 Add the pine nuts to the skillet. Stir them continuously until they’re toasted golden brown. Remove from heat. Add ¼ cup extra virgin olive oil along with the remaining ingredients. Process again until the mixture becomes creamy, scraping the sides periodically, till you achieve the texture you desire. Some people like a thicker pesto, while others prefer a more liquid pesto for drizzling. If you’d like a more liquid texture, add more olive oil by the tablespoon and continue to process till you get the texture you want. Add more salt to taste, if desired. This pesto is pareve (neutral), so it can be served kosher with either meat or dairy dishes. Here is a list of ways that you can use pesto to add fresh, herby flavor to your cooking! 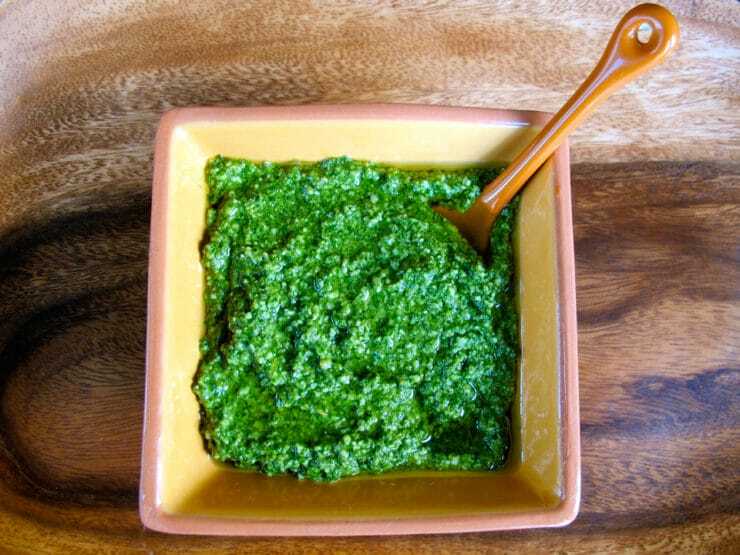 If you’re keeping kosher, use the regular basil pesto for vegetarian/dairy/fish dishes, and the pareve pesto sauce for meat dishes. Vegan cooks will want to use the pareve pesto. Note: Certain Jewish traditions do not mix fish and cheese. 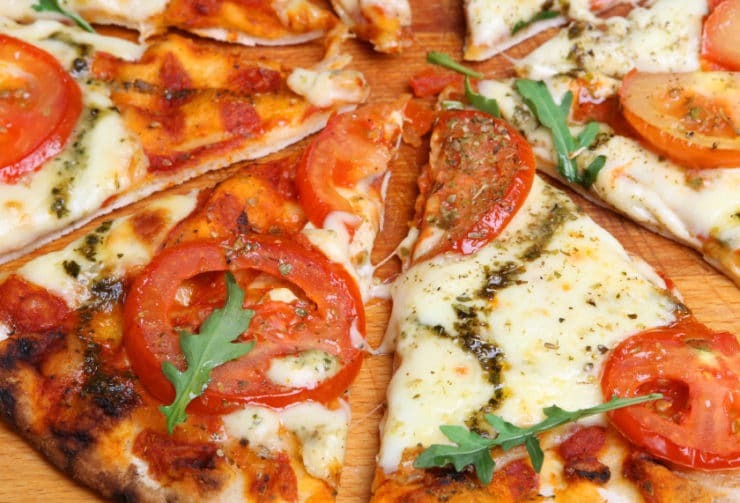 Thin crust pizza margherita with tomatoes, mozzarella, pesto, and arugula. …Roast or grill fresh vegetables, then spread pesto on top. …Use as a sandwich or panini spread. …Spread it on fish before grilling. …Use it as a meat marinade—great for chicken. …Dillute with olive oil and drizzle it on your favorite salad. …Spread it on pizza dough with parmesan and bake. 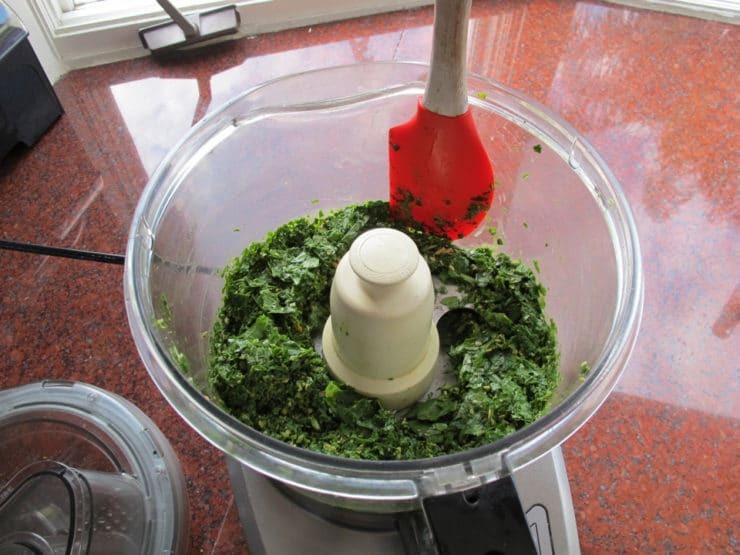 …Mix it into mayonnaise to create an herbed basil mayo spread. …Stir it into soup for added flavor. …Add it to a vegetable omelet. …Mix it into a fresh heirloom tomato salad. …Add to cooked rice or risotto. 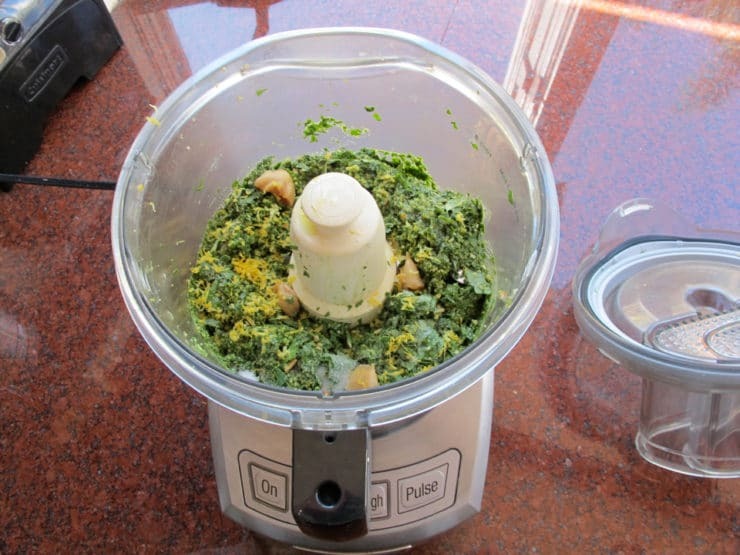 …Blend it into hummus for an herby basil hummus spread. I use roasted garlic in my pesto because I like the mellower flavor, plus it’s easier on the stomach. Use raw garlic for a stronger flavor and more “bite.” You can also use a combination of raw and roasted garlic. To learn how to roast garlic, click here. Pesto can be made ahead one day before serving. 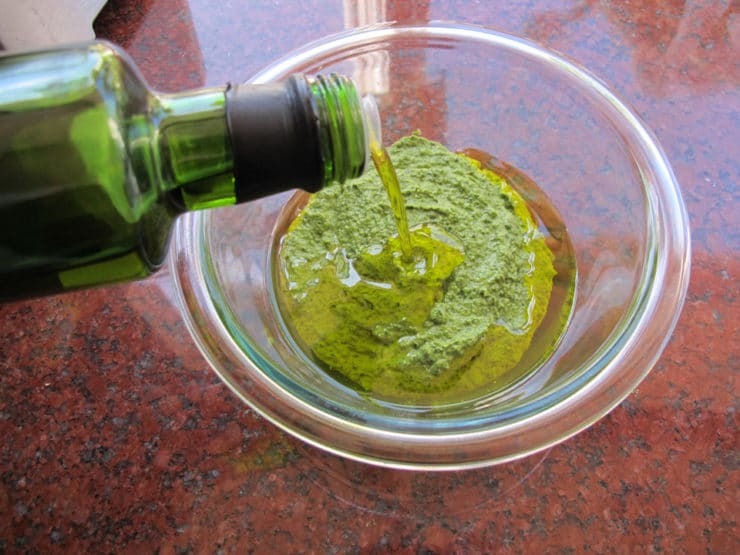 Cover the pesto with ¼ inch of extra virgin olive oil and refrigerate (no longer than 24 hours). If making the dairy version of pesto, don’t add the cheese to the basil mixture until just before you’re ready to serve. This makes the pesto taste fresher. You can also freeze pesto, which is a great way to stock up for the winter. If freezing the dairy version, do not add cheese before freezing. 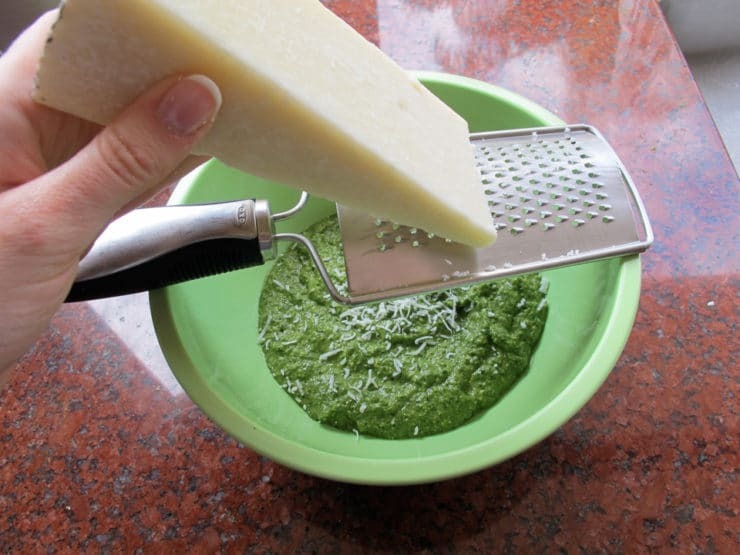 Scrape the pesto into the squares of an ice cube tray and cover with plastic wrap. Freeze the pesto “cubes,” then pop them out and wrap them individually and tightly in plastic wrap. When ready to use, thaw them and add them to your favorite pasta or soup. If making the dairy version, add cheese to thawed pesto in equal amounts (1 cube of pesto = equivalent amount of cheese), adding olive oil as needed to liquify the texture. If you’re serving pesto as a pasta sauce, add a little bit of the pasta cooking water to the pesto to create a more liquid sauce. You can also add butter for creaminess if it’s a dairy dish. Delicious over linguini or angel hair (capellini) pasta. I found your recipe for dairy-free pesto after my husband and daughter had to give up dairy. I didn’t think it would taste as good as pesto with cheese in it, but I was wrong! In fact, I made both types and compared them, and I think I like the dairy-free version better. My daughter loves pesto and it’s a great way to get additional nutrients into her, since she doesn’t like a lot of vegetables. I had something like 25 basil plants growing in my herb garden this summer and made pesto every week for my family. Unfortunately, my plants don’t like the cooler fall weather, so I am going to have to experiment with other greens for my pesto. 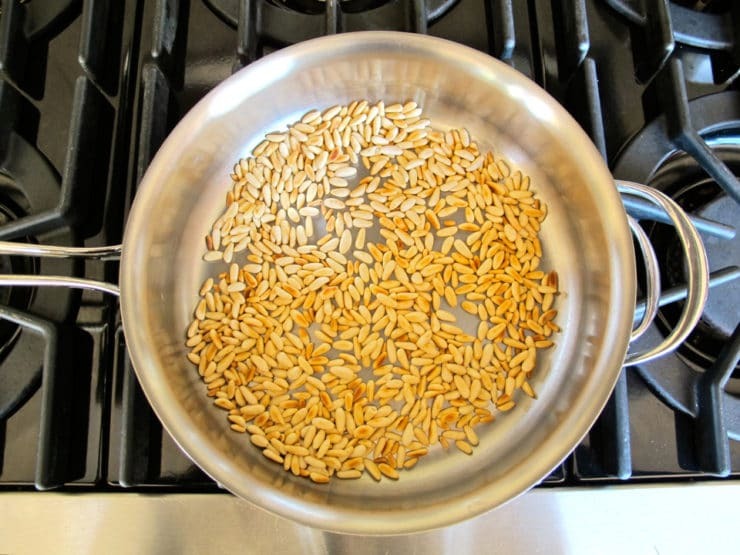 I will be using the same ratios of ingredients from your dairy-free recipe and roasting the garlic too, since I think that makes a huge difference in the flavor. Thanks for such an amazing recipe! So happy to hear that! My garden is full of basil too. 🙂 Thanks for writing! I’ve been wanting to make chicken pesto pasta for awhile now, but was a little intimidated to make my own especially since I have a dairy allergy. However, this recipe changed all that and I didn’t even miss the cheese! So yummy, thank you! Very happy to hear that Michelle! Hi Aska, Tori’s assistant Ashley here. I was not familiar with sweet basil so I did a bit of research and it looks like sweet basil is another name for common basil. The basil used in this recipe is very fresh garden basil. If the basil you use from your garden has a nicer flavor, I would suggest using that. Hope this helps! While making my pesto, I add a can of tomato paste. This changes the color and adds a different taste to the pesto. Tomato paste, especially store bought has a bitter taste. The evaporation and acid used during making paste creates this bitterness. It needs to be cooked to purge that taste and unlock the full flavour of the tomato and other ingredients. Using tomato paste in pesto (especially as much as a can) will leave a very bitter taste and the heat from the pasta won’t be enough to get the job done, like cooking the eggs in carbonara for example. For red pesto either use sundried tomatoes (homemade always best, use the olive they’re stored in as well) or red bell peppers. Peppers could either be charred then skins removed, oven baked or caramelised. Cool down either method before adding to the pesto mix. I’ve been looking for a pesto recipe that was traditional..thanks for this! 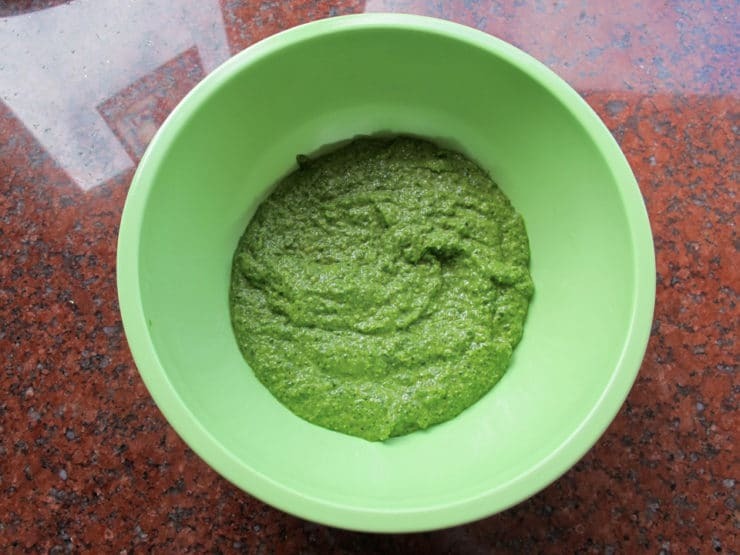 See my Pesto question under the picture of the bowl of guacamole that looks like Pesto ! Oy. Basically, my digestive system also fares better with cooked garlic as well … so in lieu of roasted garlic… to whip up some real quick…what if I “quick cook” then cool the garlic in the olive oil (or maybe just a little oil) before drizzling into the basil ? 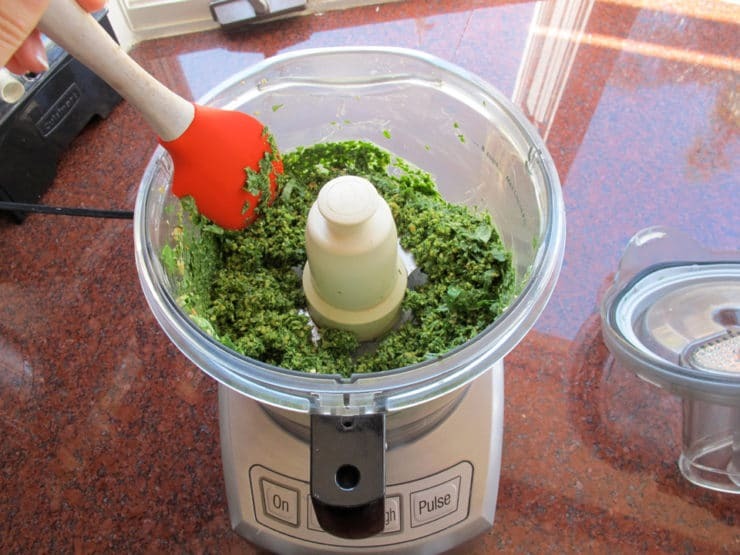 I loved making basil pesto.We can make pesto with cilantro also. Can you tell me if basil pesto can be used as a a spread in sandwithces and breads? Is basil healthy and safe?Please show some receipe where thymes can be used, I have plenty of fresh thymes growing.Thanks. love the blog! 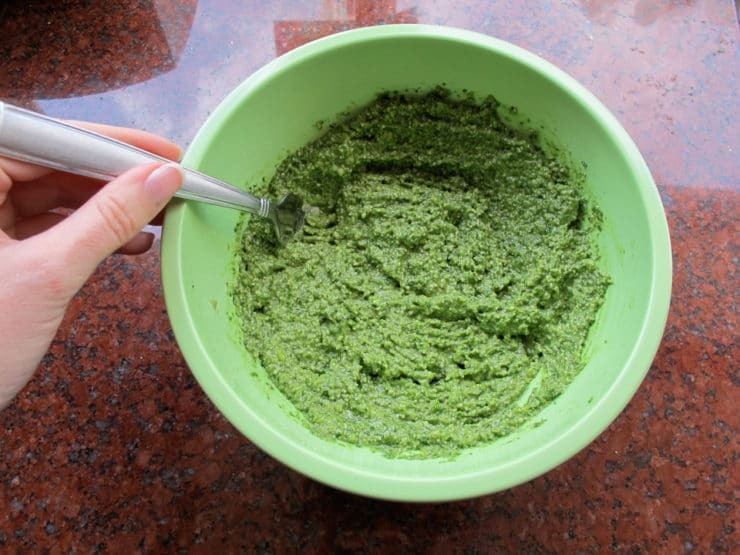 i have been wanting to make pesto dip from scratch for what feels like ages, but i always hesitate because with only 2 of us at home, we wouldn’t eat it fast enough… how long would you say the dip keeps in the fridge? I would totally try your freezer option though! thanks so much for your recipes and stories!! Hi!! I don’t like cheese so when I make pesto (usually with almonds because that’s what I have on hand), I will throw some tofu into the food processor. It makes it creamy without any dairy!!! Thank you for all of your great recipes! You’re the first blog I go to for ideas. Maybe it’s just me, but I don’t see the red hyperlink for the roasted garlic instructions. Yum I love pesto! I like that you roast your garlic, I am going to have to try that next time. Hi, Tori! I grew so much basil in my garden 2 years ago, that I still have about 10 containers of pesto in my freezer. After 2 years, the flavour is not as intense as when fresh; I compensate by using more. I didn’t make any last year and this year, I have 6 plants to make a smaller batch later in the season. I like to make it with sun-dried tomatoes – yummy! Will try your idea of roasting the pine nuts next time. 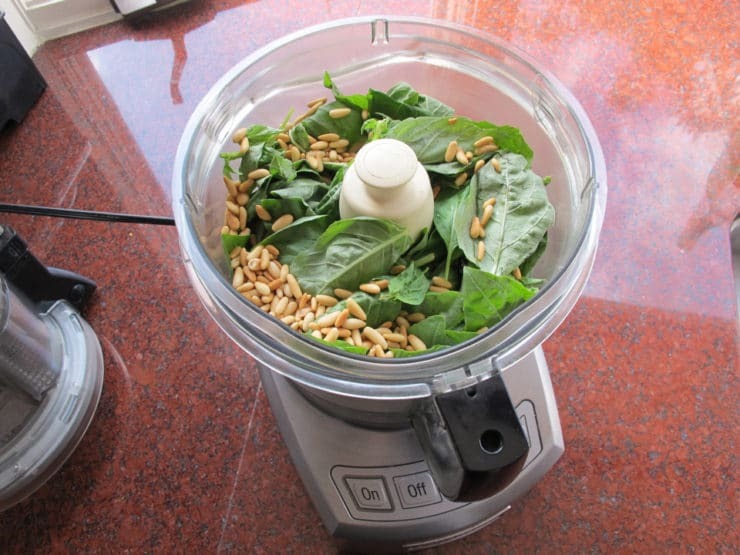 In a B&B in the CInqua Terra, I learned to make pesto with basil,italian parsley and roasted walnuts. A delicious new twist. THe lemon juice addition sounds great I will try it next time. A hint for keeping the ice cube try unstained spray with a ‘Pam’ like product before putting in the pesto. I had basil Pesto for the first time about 3 years ago and now I try to make sure that I have some in the house all the time as it is so good on so many differant things. Thank you for publishing on how to make it now I will not buy it I will make it instead and not be so tight using it. Thanks again and God Bless you you are doing such a great job. Erika, I have to tell you, it totally felt like summer in my kitchen this week. Our weather is warming up here in SoCal, and it totally put me in a pesto mood. It really tastes like summer! The most traditional Italian (Ligurian) way of making pasta with pesto is with potatoes. I have done this many times and it is really a great way to serve it. Cut the potatoes into half inch cubes (I have also seen it with thin slices, but I like the chunks better). Place the potatoes in a large pot of salted water (don’t be conservative with the salt, some will go into the potatoes and you still want some in the water when you add the pasta). Bring to a boil and cook for about 20 minutes until the potatoes are tender. Then add the pasta. Cook until al dente. Drain the pasta and potatoes but reserve some of the cooking liquid! Add the pesto to the pasta and potatoes mixture and a few tablespoons of the cooking liquid. Toss and enjoy! I love pesto! I just wanted to say that I have frozen it with the cheese for years. I make a big batch in the fall, freeze it in small containers, and have it all winter long. Before freezing, I drizzle a thin layer of olive oil over the pesto. I also find that it keeps in the refrigerator for a while after thawing. Next time I make it, I will add the lemon juice and zest. Sounds great. You say you like to use roasted garlic in the pesto. Tell us how you roast the garlic. Hi Alice, great question! In the recipes, you’ll notice that the words “roasted garlic” are highlighted in red. They are links. If you click on one of the links, it will take you to a blog I wrote about roasting garlic. That blog explains the process step-by-step.